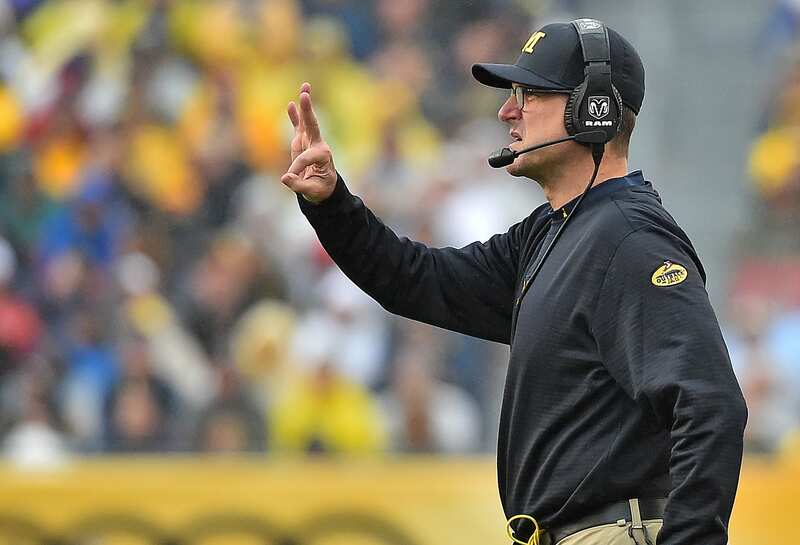 Michigan’s Jim Harbaugh is one of the figures that everyone was looking forward to hearing from during Big Ten Media Days, but after speaking on the first day, Harbaugh left fans without any of the controversial or bold statements that the coach has become known for. Still, Harbaugh shined some insight on the state of the Wolverines program headed into the last month and a half or so before the season starts, speaking about his team’s offense as well as other matters such as the coaching staff this year and whether or not college football should expand further to an eight team playoff system. Going into the season, though, it’s the quarterback situation that Michigan fans are more concerned with. Ole Miss transfer Shea Patterson is the clear cut favorite to be the started when the season rolls around, but Harbaugh didn’t commit to Patterson one way or another and pointed out that the team’s other quarterbacks were improving. Brandon Peters’ improvement is the most intriguing, as Peters was the favorite to win the starting job before Patterson arrived on the scene and was ruled eligible to play this season by the NCAA. When asked about what the team needed to be successful, Harbaugh chose not to go into details and instead went for a more simple explanation, one that he would repeat almost word for word when asked about the lack of success against Michigan’s biggest rivals. New York Giants: Is Dominique Rodgers-Cromartie The Answer After Beal’s Injury?